If you want a bike and pedestrian shared use path on the Portage Bay bridge, add your name to our letter to WSDOT and SDOT! The multi-use trail on the 520 bridge is a new, important link in the regional bike and pedestrian network, but the current plan is for the trail to end in Montlake. We see this as a half-built trail and have, along with other greenway and community advocates, been active in pushing for WSDOT to complete the trail by building the final link on the Portage Bay bridge. We believe that the neighborhoods of Seattle would be best served by a simple, safe and direct connection between Montlake and the Delmar lid (where I-5 and 520 meet), and are happy that we have been able to help put this back in the spotlight where it needs to be. 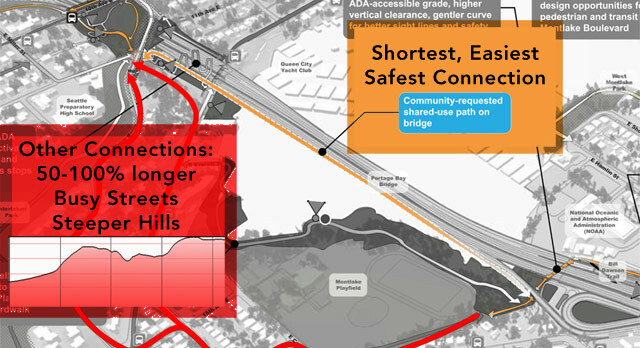 The current plan calls for people trying to reach Downtown, Capitol Hill, or Eastlake to wind through the neighborhood after the trail ends by Montlake Blvd. The problem is that these routes all have either steep hills, busy streets with high-speed traffic, or circuitous routes that can be up to double the length that the portage bay multi-use trail would be. While these routes serve local connections inside Montlake well, they don’t foster inter-neighborhood connections that are dramatically different from what we have today. 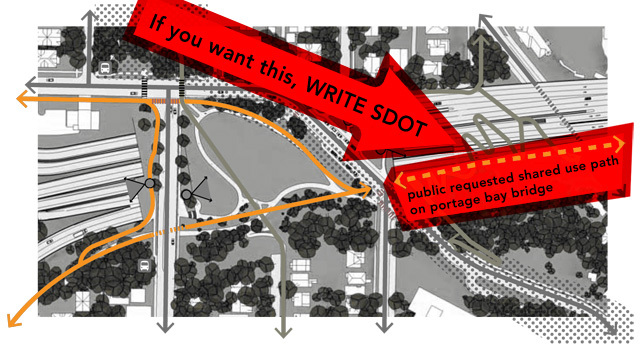 A multi-use trail on Portage Bay would do that and if it is going to be done, now is the time to do it. If it is not built with the replacement now, the cost and hassle of jury rigging something later is going to make sure it never happens. That’s why we need your support and help in getting SDOT on board and willing to advocate for completing the multi-use trail all the way to Eastlake. We need them to ask WSDOT to build the trail on the Portage Bay bridge in order to take the next step and make that connection a reality. We will be sending a letter to SDOT and WSDOT and you can help by get this built by signing on to as a supporter to the letter: You can read our letter and digitally “sign” the letter in under a minute by filling out this brief form. Thank you for your support and letting them know that this is a priority. This is the right thing for Seattle and a long-sighted investment that will serve the city for decades to come. This entry was posted in 520 Campaign by admin. Bookmark the permalink.